Circus Improvisation is a game staging two teams of four to five acrobats who compete on the stage, combining circus disciplines and improvisation. It is an evening where circus artists of all generations and disciplines come to risk, for us, the public, without costume and make-up, performances that are still unknown to them. Used to being on stage and knowing by heart the accounts of their choreography, seeing them on the dance floor without preparation is of unequalled beauty. We invite you to come and see their many talents put to the test and we are proud to help them experience this insecurity. 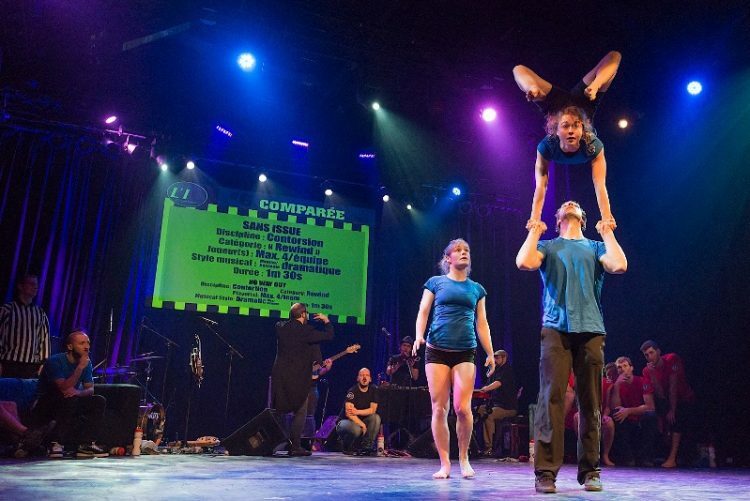 Created in Montreal, Canada in 2009 by two professional acrobats, Nicolas Fortin and Philippe Trepanier, the Circus-Improvisation concept was directly inspired by the theatre improvisation concept also created in Montreal in 1977 and that spread all around the world since then. The universe of improvisation game was itself inspired by Canada’s national sport, ice hockey.